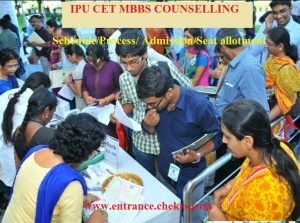 IPU CET MBBS Counselling 2017(गुरु गोबिंद सिंह इंदरप्रस्थ यूनिवर्सिटी कॉमन एंट्रेंस टेस्ट मब्ब्स काउंसलिंग )is going to be conducted in the month of June 2017 for providing admission in MBBS courses in the affiliated medical colleges of Guru Gobind Singh Indraprastha University (GGSIPU). Candidates will be called for GGSIPU MBBS Counselling 2017 on the basis of their rank in IPU CET MBBS Merit List which will be declared based on NEET 2017 score. During IPU MBBS Counselling Schedule, applicants have to go through a number of subsequent steps such as registration, documents verification, fee payment etc. Therefore aspirants can get more details of counselling such as IPU MBBS Seat allotment, results, merit list etc by going through the article below. The candidates must be present in person for the counselling. University will conduct the 3 rounds of the counselling. Candidates are required to register first for participating in first and second round of counselling. However, for third round the candidate need not to register. Candidate must make payment of counselling processing fee of Rs. 1000/ (non-refundable). After succesfull registration and verification of documents, applicants will be alloted their seat. A candidate who is allotted a seat, have to make payment of Rs.27,500 at the time of counselling. The payment is required to be done in form of demand draft in favor of Registrar, Guru Gobind Singh Indraprastha University payable at Delhi. The first two round of the counselling will be held for the ‘GGSIP University Quota’ (State Quota). The third and last round will be held for the All India Quota candidates. Guru Gobind Singh Inderprastha University will conduct the IPU MBBS CET Counselling for allotment for seats in various MBBS courses. Eligible candidates will alloted their desire seats at the end of counselling through IPU MBBS seat matrix. Candidates will be offered the seats upon merit basis, category and as availability and choice. The IPU MBBS 2017 counselling results will be soon declared and we will also update you here with the same. For more updates on IPU MBBS Counselling make frequient visit to our site and you can also receive alerts on Upcoming Engineering UG entrance Examination.